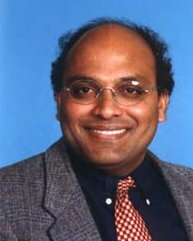 Professor Rajeev works on various problems in theoretical physics arising from high-energy physics, as well as other fields such as string theory, nonlinear optics, hydrodynamics and quantum information theory. The focus of most recent work has been on non-commutative geometry and probability theory, which has applications to understanding Yang-Mills fields as well as to string theory and even classical problems in hydrodynamics. Solitons in field theories of high energy physics and nonlinear optics is another theme of research.